First heard of this show from hearsay but it wasn’t until I found out it wasn’t until I found out Gerry Anderson, the creator of Thunderbirds, did the model work for the show. Also was surprised that Martin Landau and Barabra Bain were in it as well. They were both in the Mission Impossible TV show and I guess this is what they did after it ended. This show takes place in the retro-future of 1999, this show was also made in 1975 and you can tell from the opening credits. The first episode gets the series going and after that, all the journeys they go on are pretty cerebral. Theirs’s a lot of talk about nuclear radiation and immortality motifs in it so far. I’m still watching it on and off on tubi.tv since the DVDs and digital copies are hard to come by. They also made a 2nd season that’s more on the action side and a 3rd season, though it was canceled last minute. This show became a cult hit in the later years and you can watch it on tubi.tv if you don’t mind commercials. There’s even a comic about the fate of the earth after the first episode. It’s a pretty good show so far and I’m just going to say this show isn’t Star Trek at times. 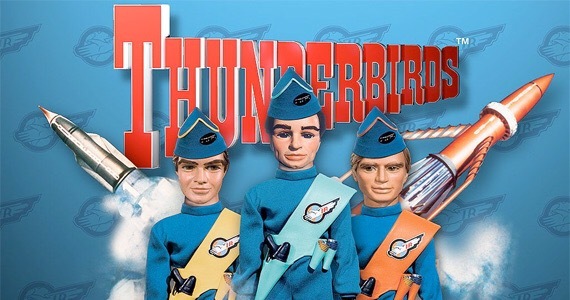 Watching this reminded me not just of the reboot, Thunderbirds Are Go!, but of the movie Team America: World Police. Since this uses puppets or marinates like that movie did. After binge watching Thunderbirds Are Go! on Amazon video it made me want to see the original show. Watching it on the Shout! Tv app I was surprised at all the sets and the little vehicles made for this show. The original is about an hour long and the pace might be kinda slow to today’s audience. Since this was made in the 1960’s and television was more in your face at the time. It’s also pretty colorful it being a 1960’s animation show, has that pop art feel to it and is even more amazing in HD. This show was also considered to be the crow jewel in Gerry Anderson’s shows with the puppets. You can give this and his other works a watch since they all have their own strengths to them as well. There’s also my Stingray review if you want to know about that show as well.